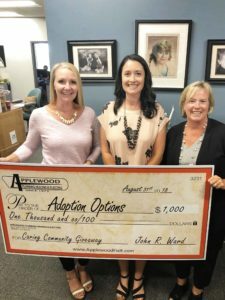 Applewood Plumbing Heating & Electric awarded $1,000 as part of their monthly Caring Community Giveaway to Adoption Options, a non-profit based in Denver. Since 1981, Adoption Options, Colorado’s premier adoption agency, has placed close to 1,800 infants and children in safe, loving homes. They have supported thousands of birth parents through the difficult process of selecting the best choice for their children and themselves. Adoption Options also supports adoptive families, foster parents, child welfare professionals and adoption professionals around the country through their progressive training and education program. “We’re always happy to help organizations like Adoption Options who are working so hard for the children in our community,” said John Ward, president of Applewood Plumbing Heating & Electric. Adoption Options facilitates adoptions of infants, older children, sibling groups, foster children and children with health and emotional challenges. Adoption Options’ believes that all children deserve a family to call their own. Their Infant Adoption and Flexible Family (foster-to-adopt) programs are tailored and designed to find the right family for a child and to ensure that children are successful and stable so that they may find permanency in a family. Central to Adoption Options’ service for their domestic infant program is its counseling program for women and couples who are considering adoption as an option for a crisis pregnancy. Through this program, Adoption Options counsels over 250 birth parent clients a year. Qualified counselors provide objective, sensitive and supportive counseling for birth parents throughout the lengthy decision-making and emotion-healing process…regardless of the birth parent’s final choice. “We’re thrilled to be the recipient of Applewood’s $1,000 giveaway this month. The money will help place more waiting children into permanent families,” said Joan Cordo, Director of Fundraising and Development. For more information about Adoption Options visit www.adoption-options.com.